La Creme Wedding Cakes – The most beautiful and delicious wedding cakes in Nashville and Middle Tennesse! The most beautiful and delicious wedding cakes in Nashville and Middle Tennesse! La Crème specializes in beautiful, custom designed, cakes that reflect the personality and style of your wedding event. We are dedicated to giving Middle Tennessee brides the wedding cake of their dreams. From traditional to contemporary, rustic or whimsical, we will create the perfect cake for your special day. Bring us any number of visual sources to serve as inspiration. We love to get design ideas from your invitations, your reception site, samples of fabric, your bridal gown, or favorite china. Wedding cakes by La Crème are not only beautiful but melt-in-your-mouth wonderful. Just as much thought and care go into our recipes as our designs. 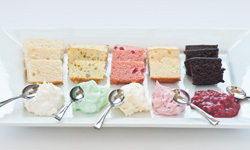 Our menu has a full range of flavor options, each created to be a stand alone dessert. We use only the highest quality ingredients, and all of our cakes, fillings, and icings are created from scratch and made fresh for each occasion. Your wedding cake should be the centerpiece of your reception. Make a statement that will not be soon forgotten. Treat yourself and your guests not only to a beautiful cake, but a delicious one as well.